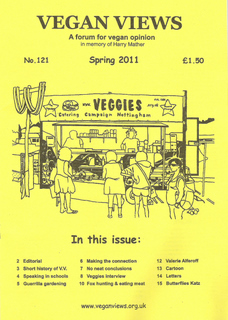 Vegan Views 1975-2013 The Spring 2013 issue (No 127) of Vegan Views magazine - which you can download below - was our last printed issue. Times have changed and it seems many people now prefer to go online rather than read printed magazines. Future plans We had hoped to add new interviews, articles, reviews, etc to the website, or maybe publish small magazine pdfs - but, for a mixture of reasons, have not done anything yet. For this to happen we need to find one or two helpers with more expertise than we have in running and promoting websites and using social media (especially Facebook). Also nowadays there are a vast number of ‘vegan views’ online, so we want to be doing something that is a little different rather than just repeating what is happening elsewhere. If you're on our email list we'll keep you informed of any developments - contact us if you want to be added to this list (or if you’d like to help). Vegan Views has always been produced by unpaid volunteers on a non-profit-making basis, and although UK-based we welcome readers from any country. See also our Information page, with details of our past approach. 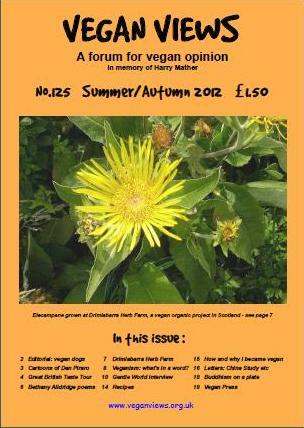 Spring 2013 issue Vegan Views No 127 - pdf (5 MB) opens in a new window. This issue includes an interview with vegan dietitians Jack Norris & Ginny Messina. 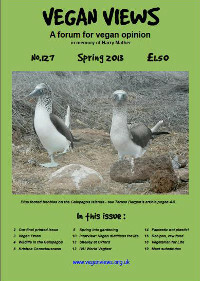 Also articles by Teresa Bergen on her recent visit to see the amazing wildlife in the Galapagos islands, by Debbie Andrews on the environmental impact of plastic, and by Zion Lights on gardening the vegan way. Plus other articles, news, recipes, etc. For older interviews see our Back issues section. 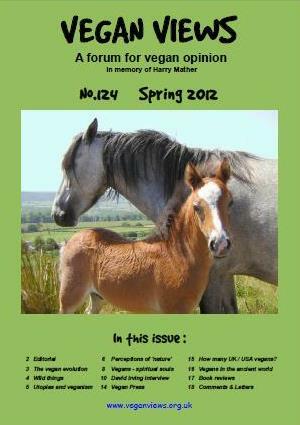 Vegan Views magazine is freely available online, and magazines in pdf form can be downloaded here. If you have any problems let us know and we can email you a pdf instead (but first try right clicking on the pdf link, select 'Save Target As' or 'Save Link As', download it to your desktop, and then try to open it from there). 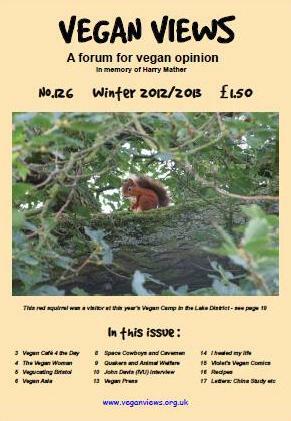 See below for issues 121 to 126, and for many earlier magazines see our Back issues page. If you come across links that don't work, or spot other errors, please get in touch - thanks.